15 Minutes with a Dairy Farmer | Winners Drink Milk! If you had 15 minutes to ask a dairy farmer anything, what would you want to know? Dietetic Intern Kylie Mennel had her questions ready. My name is Kylie Mennel, and I am a dietetic intern at the American Dairy Association Indiana. I have some background knowledge on dairy nutrition, but I am looking for answers regarding dairy cows, dairy farming and practices held on the farm. To help get my questions answered, I had the pleasure of speaking with Sam Schwoeppe, a fifth-generation dairy farmer of Schwoeppe Dairy LLC in Huntingburg, Indiana. Kylie: How many different breeds of cows do you have? Sam: We have Holsteins and a few Brown Swiss dairy cattle. Kylie: Do your cows have names? Sam: Yes, our herd all have names. Kylie: Do you only have cows? Sam: We operate solely as a dairy farm and do not have any other animals on the farm, with the exception of 2 dogs and several cats. Kylie: How many times do you milk your cows a day? Sam: We milk twice a day. Kylie: On average, how much milk does a cow produce each time that it is milked? Sam: Our cows give about 40 pounds (about 5 gallons) each milking. Kylie: How long does the milking process last? Sam: From the time the cows enter the milking parlor, until the time they exit the parlor, it takes about 15 minutes. The actual milking process takes about 5 minutes, the remainder of the time is preparation, sanitation and disinfecting the cows’ teats post milking. Cleanliness is the priority during the milking process. Kylie: Who do you provide your milk to? Sam: Our milk is processed 8 miles from our farm at the Prairie Farms plant in Holland, Indiana. Kylie: What do you feed your cows? Sam: Our cows eat a high forage ration which primarily consists of hay, corn silage, grass, corn and soybean meal. Kylie: How much water do the cows drink daily? Sam: Our cows drink between 80 and 120 gallons of water each day. If the outside temperature is hot, a cow will drink a lot of water to keep her internal temperature cool. Kylie: What happens when a cow gets sick? Sam: It is very similar to when you get sick. We take her temperature, look in her eyes to see if they are watery or irritated, look in her mouth to see if she is salivating and has good mouth color, listen to her heart and stomach and feel all over her body for inconsistencies in skin texture and other abnormalities. If we think she has a stomach ache, we give her pepto bismol for cows and if we are unsure what is bothering her, we call the veterinarian to come and check her vital signs and condition. Our veterinarian makes house calls, so she can stay comfortable in the environment she is accustomed to. Kylie: Do cows take baths? Sam: Cows love to be washed off in hot weather! The cool water loosens their hair and allows them to cool off better. It is very similar to washing your own hair after a windy day or ride on a motorcycle. Kylie: What do you do with the male calves that are born? Sam: Our male calves are sold to young men who have their own business they began during their Future Farmers of America career. They buy our calves and raise them on their farm and have their own custom beef business. Kylie: How are dairy calves raised? Sam: Our calves are raised in our nursery. They have individual pens under a roof that is specially designed for comfortable air flow and protection from the elements. Kylie: Are the calves housed together? Sam: In the nursery, just as in the hospital, our baby calves are kept in separate pens. When they mature into what in humans would be the pre-school stage, they are grouped together with a few of their herd-mates and learn social behavior and community living much like pre-school is for children. Kylie: When is a calf considered a cow? Sam: A female calf is a heifer and she progresses through life stages just as human animals do. First, we have a baby calf, then a yearling heifer, a juvenile heifer, a pre-pubescent heifer and post-pubescent heifer. Six to eight months after puberty, a heifer is bred and when she has her baby she becomes a first lactation heifer and after her second calf, she is a full-fledged milk cow. Kylie: Can you use milking cows for meat production? Sam: Dairy cows are the foster mothers of the human race. We nurture our cows and provide them with a clean and comfortable home and they in turn nurture human families with their nutritious, delicious milk. At the end of her productive life, a dairy cow is repurposed in another way to continue to nourish our families as meat. Kylie: How can you tell the difference between a dairy cow and a beef cow? Sam: Besides the differences in hair color, you will notice a dairy cow is a lot like an endurance athlete. She is built for efficiency and speed and a beef cow is very similar to a weight lifter who is built for strength and a bulky body mass. Kylie: How long does a cow spend on a dairy farm? Sam: The average age on dairy farms varies from farm to farm. 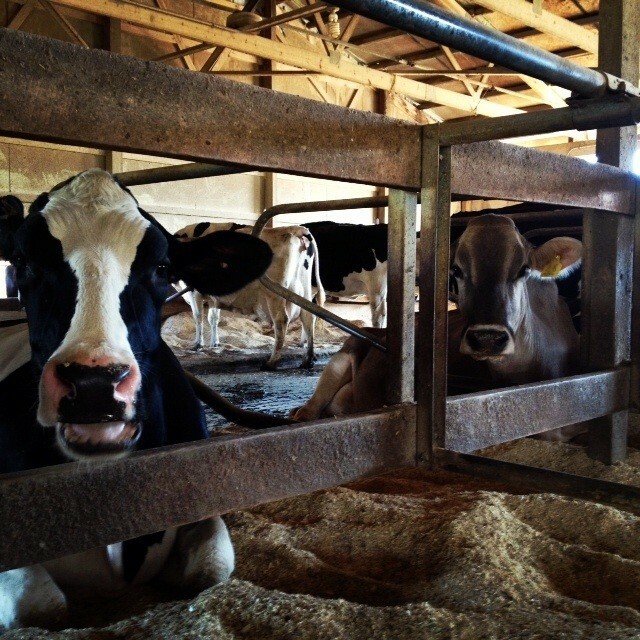 On our dairy, the average age of the dairy cows is a little over 5 years old and our oldest cow is 15 years old. Kylie: What is your favorite thing to do on the farm? Sam: I love taking care of the baby calves and raking hay. Kylie: What is the last thing you do on the farm before calling it a day? Sam: The very last thing I do on the farm outside is stop for a moment on the porch and listen to the orchestra of sound that is our farm. Depending on the season you will hear the frogs on the pond, the cat meowing at your feet, the dog panting because she is glad to see you, the calves jumping around in their pens playing with one another, the chewing sounds of hay being enjoyed, and if it is summer you will hear the tearing sound of grass being enjoyed in the pasture and the breeze in the trees. It is a beautiful sound event and the perfect time to say thank you for the blessings we receive in this life.